The village of Loxton is referred to in the Domesday Book as Lochstone, which suggests a Saxon origin. It was part of the Somerset possessions of Count Eustace of Bologne, no doubt one of the followers of the Conqueror. It is stated that the manor had seven plough teams, a mill, fifty acres of meadow, six acres of underwood and a number of serfs, villeins and boors. 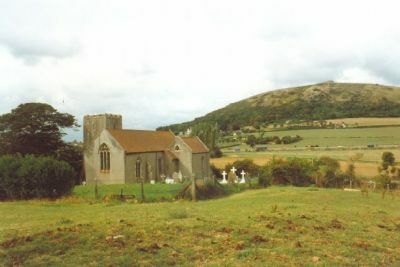 In 1225 the manor was given by Gervase de Sparkford to Philip de lnsala as his daughter’s (Jordana) dowry and in 1291 was excluded from the Royal Hunting Forest of Mendip. There are traces of Norman work in the porch and tower and it seems probable that it was built on an old Saxon foundation. 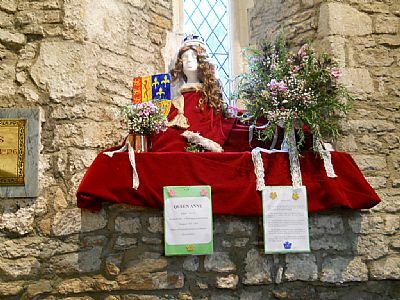 The first authentic date is from the list of Rectors (to be seen on the westwall of the Nave), which is complete as from 1297. There are no records of any early restoration. In 1900 the roof was renewed and a small organ chamber built. 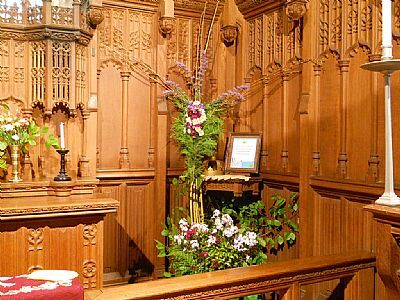 In 1913, the walls were stripped of plaster and the Chancel encased in oak surmounted by carved angels. 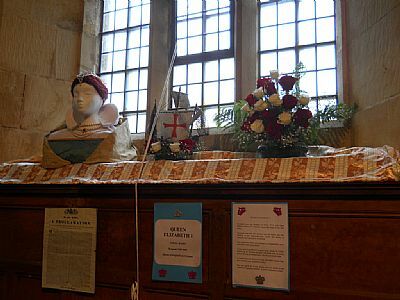 Note the little Cherub on the right above the altar with little wooden tears on his cheeks. In 1926 the Vestry (now the Lady Chapel) and present organ chamber were built. On entering the porch there will be seen on the right a fine specimen of an ancient hagioscope (or squint). Through this the Sexton had a direct view of the altar, enabling him to see the celebrating Priest elevating the Host at the Mass (or Holy Communion) and thus ring the Sacring Bell. 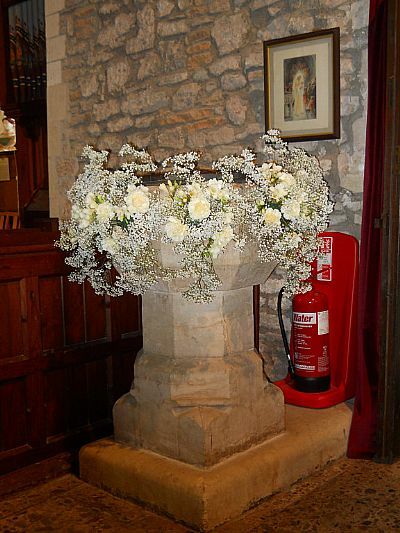 The Font dates from the 14th century and has a Jacobean cover. The Pulpit with the exception of the four steps, is carved from a single block of stone, and rests upon a corbel in the shape of a prostrate man. It dates from about the 15th. century. In front of us stands the old oak screen which goes back to about 1501. 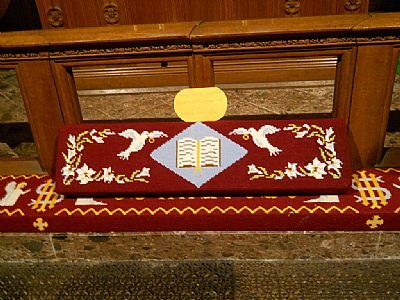 It has largely been restored, but the original is plainly seen with its linen fold panels. The carving of half rose, half pomegranate on the inside of the doorway arch might be symbolic of the union of the House of Tudor (rose), with the House of Aragon (pomegranate) in 1501. There is a stairway with a door behind the pulpit which led to the Rood on the Screen. The present screen is not in its original position. The Chancel is paved in Draycott stone and was restored in 1913. 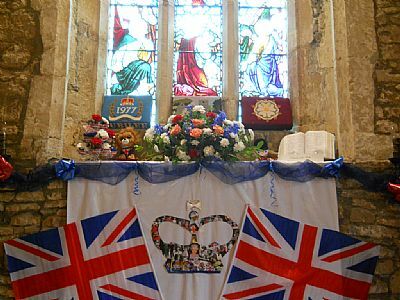 The Chapel is now kept locked and used as a Vestry - the original Vestry is now used as the Chapel. The north side of the Chancel was probably the site of the original Saxon Church. Note the fine Piscina. The glass in the north window is all that remains of the original 14th century glass. 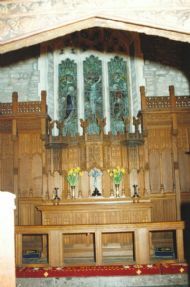 The Chapel was restored in 1949 and the windows over the Altar are memorials of the two great world wars. The figures on the ancient corbels are hand carved in oak, and painted - the work of Arnold Robinson of Bristol who also designed and made the World War II window. 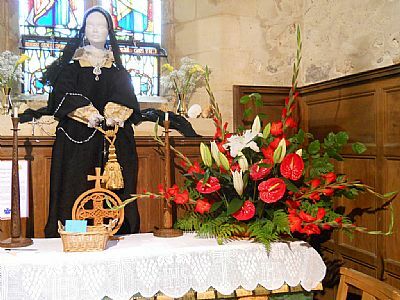 The figures are representative of St. Mary for Mothers who gave their Sons in the Great Wars; and St. Andrew, the Patron Saint of Loxton Church, for those who were called upon to bear a cross, or who died. The Bells. The Church has six bells, two of which are pre Reformation. The third bears the inscription SANCTE NICHOLAIE. the fifth is mediaeval and is inscribed BEATA VIRGO KATERINA. The fourth bell, a Bilbie Bell, dated 1736, was recast in 1907 when the other three, the first, second and sixth were added. They are rung from the porch and are regularly used. The Churchyard Cross is 15th century and the upper portion was restored in 1910.